Employees and patients turn to more remote or distant parking areas as your hospital grows or construction projects compromise your available parking space. Long walks to the hospital are inconvenient, potentially painful and sometimes unsafe, especially in adverse weather. HealthPark’s Hospital Shuttles provide safe, comfortable and timely transport from remote parking areas directly to your hospital door. Like our personable, caring valets, our drivers are more than drivers. Our well-trained shuttle and driver staff delivers our signature compassion, respect and understanding while interacting with your staff and enhancing the patient experience. Our shuttles not only provide safe transportation between your facilities and your parking lots. Our HealthPark shuttle drivers also patrol and monitor your parking areas, offering a helping hand wherever possible and keeping an eye on the parking areas for potential problems—as well as opportunities to help employees and patients in need. HealthPark can provide drivers for your existing vehicles or provide golf carts, mini-vans, wheelchair accessible shuttle vans and buses. 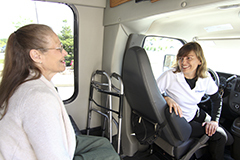 We custom-design each hospital shuttle program and provide you with the right size vehicle for your needs. Contact us to learn more. patients valuable assistance while providing additional safety and security.